A SOUTH AFRICAN EXPLOITATION CLASSIC! ROUGHER AND TOUGHER THAN ANYTHING YOU’VE SEEN BEFORE! Master criminals meet violent death in Johannesburg, South Africa, a city wrought with organized crime. Steve Chaka (Ken Gampu), an ambitious news reporter, learns that these deaths are from the hands of an all-black vigilante group known only as “War on Crime”. Teaming up with Lt. Ben Deel (Nigel Davenport, CHARIOTS OF FIRE, A MAN FOR ALL SEASONS) of the local police department, Chaka investigates anonymous tips regarding future “hits” and ends up fighting for his life to uncover the truth behind the vigilante killings! 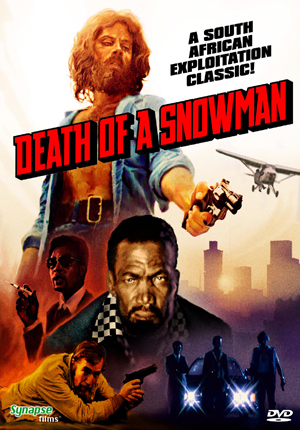 DEATH OF A SNOWMAN is an action-filled South African “grindhouse” gem. Exploitation fans will enjoy the outrageous violence, erratic editing, funky disco soundtrack and jaw dropping dubbing. Also known as SOUL PATROL and BLACK TRASH.